[JRASERVER-1369] Reduce JIRA email chatiness - Create and track feature requests for Atlassian products. We're glad to announce that we’ve enabled batching of email notifications on jira.atlassian.com. This means that notifications for edits made to a single issue within the 10-minute window are now grouped together, and sent in a single email message. This feature will be shipped with Jira Server 8.0 soon. Meanwhile, you can experience it here on our public Jira instance, together with other features planned for Jira 8.0. In Jira 8.0, Jira admins will be able to reduce the number of email notifications users receive by enabling the instance-wide email batching in Jira administration. Users will be notified about all issue changes made within the 10-minute window in a single email message. The only exception is mentions. When users are mentioned in an issue, they’ll be notified immediately. As part of this project, you will also get a new look and feel of email notifications. For the time being, emails containing mentions use the old look and feel, but the new one will be available soon, and shipped in Jira 8.0. Admins will need to manually switch on batching of email notifications in Jira 8.0. In the coming releases, we will ship additional capabilities and enable batching by default. Please note that new notifications come with a new email subject, so if you’re using inbox filters to filter out messages, you’ll need to update them. In the coming releases, we will add support for custom fields in batched email notifications. This is important specifically for those customers who use custom fields in their customized notification email templates. To read about other capabilities we’ve added in Jira Software 8.0, or to download a beta version, have a look at Jira 8.0 Beta Release Notes. 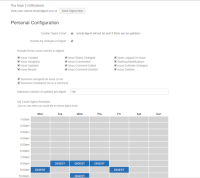 Have the ability to configure the notifcation period (eg. 10 minutes). Then every period the outstanding notifcations are proccessed and sent. To notifcation service should combine all updates for a single issue made by the same jira user into one email. This would reduce the volume of email notification. 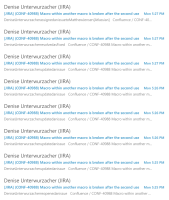 It is a real pain when you make 3 quick changes to a jia issue and this generates 3 emails. Thie more redundant emails jira sends the less likely people will read all of them. Jira still sends emails to me when I have made the change. Surely this should be able to turned of at least under my profile settings. (eg. "Don't notify me of change I make" ). JRASERVER-15840 Allow users the option to summarize their email notifications into one email. JRASERVER-7888 New user preference to turn off all email notifications - for holidays etc.